This year, I’ve been working on several projects. The first is a spin-off series to Secrets in Silk, titled the Earls Next Door. Several characters (Cain Sinclair and Amelia Hartford) will make an appearance in this new series. 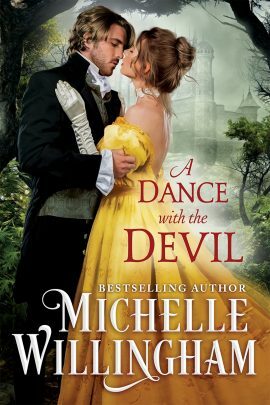 It’s a trilogy about three earls who find love in Victorian-era England. The first book was inspired by The Secret Garden and is titled Good Earls Don’t Lie. It’s tentatively set to release in September of this year. The second project I’ve been finishing up is the sequel to A Viking for the Viscountess. A Maiden for the Marquess was originally intended for release in fall of 2016, but it had to be set aside temporarily. It should hopefully go out to my editor in March and be released in early summer. My apologies for the delay! If you’d like me to e-mail you when one of these books releases or when there’s a special sale, you can sign up for my newsletter. This year, I’ve written a new series of books set in medieval Ireland. Warriors of Ireland was inspired by Game of Thrones and the fairytale “Beauty and the Beast.” Book one of this duet, Warrior of Ice, will release June 20, 2015, in stores and July 1st in e-book form. The second book, Warrior of Fire, will release in late November/early December. I have plans to write a sequel to A Viking for the Viscountess, and I hope to release it in August or September of this year. If you’d like me to e-mail you when one of these books releases or when there’s a special sale, you can sign up for my newsletter here. The year is winding to a close, and I have two more books forthcoming. The first, Unlaced by the Outlaw is the final story in the Secrets in Silk series. It tells the story of prim and proper Margaret Andrews who is stranded in the wilderness with a wicked outlaw, Cain Sinclair. 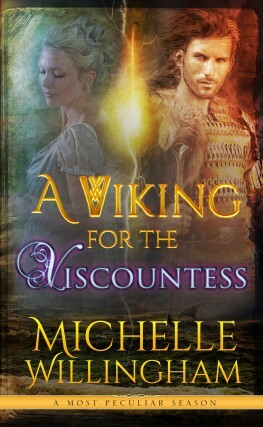 The second book, A Viking for the Viscountess will be out on November 18. It’s a “unique” book, born from my love of time travel stories. I wanted to explore what it would be like for a Viking to time travel forward to the Regency era. Arik Thorgrim isn’t at all the sort of hero Juliana Arthur, the Viscountess Hawthorne, was expecting. But the two of them make one of the most interesting couples I’ve ever written. 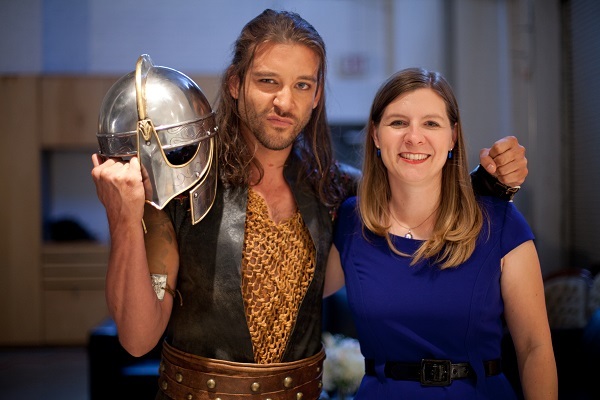 It was terrific fun to bring a Viking into the ballroom, so I hope you’ll enjoy the book. This is a draft of the cover, and it is one of the books in the series: A Most Peculiar Season. It’s part of an author collaboration with Deborah Hale, Ann Lethbridge, Barbara Monajem, Gail Ranstrom, and others. The books will feature unusual events in the Regency era, and our characters will interact in the different books. As we move toward the holiday season, I wish you and your families all the very best! Giveaway ends January 17, 2014. Congratulations to Heidi Howard, winner of my cookie giveaway yesterday and Charlotte McFall, winner of the international giveaway of a free book! For those of you visiting for the first time, the Harlequin Historical Authors Holiday Giveaway is back! In the spirit of an Advent calendar, authors are giving away daily prizes and a Grand Prize of a Kindle Fire HDX Wi-Fi (or equivalent tablet depending on your location). Play every day for more chances to win. Each participating author will have an activity planned on their website for their special day. You may be asked to comment on a blog, find an ornament, or visit a Facebook page. For each day you participate, your name will be entered into the Grand Prize drawing. For the official rules, click here. At the end of the month on December 23, one day from the calendar will be randomly selected. One of the entrants from that day will then be randomly selected to win the Kindle. The more days you visit, the better your chances! 1. Sign up for my newsletter below by typing your e-mail address in the Newsletter box at the bottom of this page. Your e-mail address will never be shared and you may unsubscribe at any time. If you are already a subscriber, you can skip this step. 2. 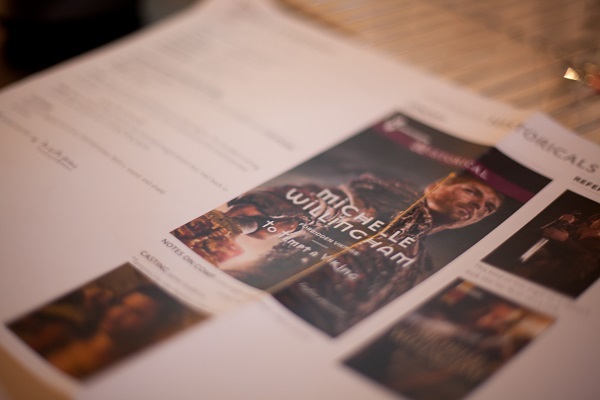 Send an e-mail to me by clicking this link (contest AT michellewillingham.com). Then in the body of the e-mail, tell me your full name and address. Entrants who do not provide their address will be ineligible, so don’t forget! Happy Holidays and click on the calendar to visit each author! 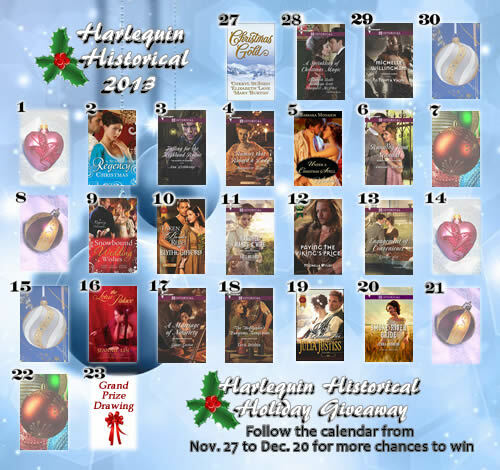 Today is my giveaway for the Harlequin Historical Advent Calendar. To celebrate a day of great bargains, I’m offering several prizes, and of course, when you enter my giveaway, your name will automatically be entered for a chance to win an Kindle Fire HDX! First, for folks in every country around the world, enjoy a free download of my novella “A Wish to Build a Dream On” with an extended excerpt of my August title To Sin with a Viking. Just click here to choose your e-book format (Nook readers can get the epub format for free from the Smashwords link on that page or from All Romance E-books–Barnes & Noble has not yet price-matched the title). Now for my raffle giveaway. One of the holiday traditions in my household is baking cookies. 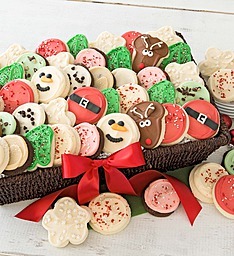 We LOVE gourmet cookies (especially those with frosting), and so I’m going to give you a chance to win gourmet frosted cookies from Cheryl’s. (This one is for U.S. residents only). See details below on how to enter. Don’t worry–I also have a giveaway for my international readers, too! For you, I’m offering up a chance to win a copy of my latest book, Unraveled by the Rebel. I’ll choose one U.S. winner and one international winner at the end of the day. Winners will be posted on this website on November 30. Even if you miss the deadline for this giveaway, you can still sign up for my newsletter and send me a note to be eligible toward the grand prize. Good luck! 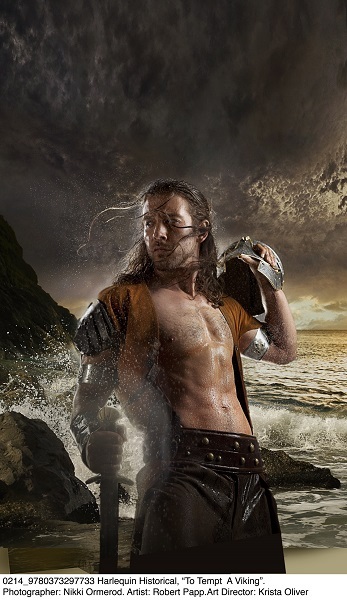 Please read the official rules here and check out my upcoming book from Harlequin Historical, To Tempt a Viking, available February 1, 2014. After more than six hundred photographs were taken, the art director, Krista Oliver, begins flagging the best photos to potentially be used for the cover image. I’ll admit that there were so many good ones, it was difficult to choose! I had several that I liked, but Krista chose one that was more evocative of a Viking warrior after a shipwreck. After the final photograph is selected for the cover, it’s sent to an illustrator who will fill in the background details of setting and so on. Robert Papp created the background (He was also the illustrator for Tempted by the Highland Warrior and Taylor David was the model on that cover as well). Robert chose to create a shipwreck scene, after the hero is on shore. Here is the final illustration before the cover details are laid over it. Notice that Taylor’s left arm band was adjusted to fully encircle the bicep, whereas in the first photograph, the arm band was tied on. To me, this is gorgeous art. Honestly, I would be happy with this as my cover and nothing else! But after the illustration is approved, the publisher’s branding and imprint are overlaid on top of that (e.g. the purple band across the top that says Harlequin Historical), as well as the title and author name. Harlequin chose a Viking-style font to be used for my name. The back cover copy is also placed on the art file, and the cover goes through more rounds of proofing and image-checking to be sure it fits the correct specifications for both digital and print publication. Colors are checked, measurements are checked—everything goes through several levels of approval before the final cover is ready to go. I hope you’ve enjoyed the behind-the-scenes process of how cover art is made! Enjoy book 1 in the Forbidden Viking series – To Sin with a Viking (Get it in e-book form for $1.99, right now for a limited time!) Want to ask questions or comment? Join me on Facebook or Twitter and ask whatever you’d like! Midway through the shoot, I was invited to play dress-up. I went with the stylist, Marie-Eve, back to the costume rack. While earlier we had talked about whether I would try on a Regency gown, I’m well aware that most of the gowns are fitted to size two models! After having three children, let’s just say that a size two was NOT going to happen for me. 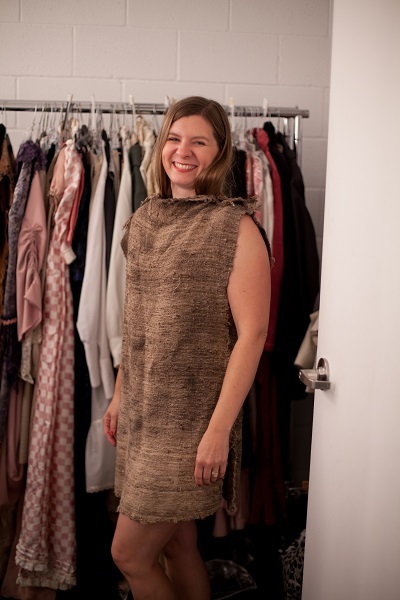 Instead, we picked out a rough-textured beige tunic that resembled a potato sack with arm and head openings. Over that came a brown leather tunic and a broad belt to hold it together. Then she put on brown leggings over my knees and calves. Since I had worn heels, I had to borrow a pair of flip flops to wear on set. She also gave me two rings to wear. I have very small fingers (my rings are a size 5) but some of these rings would hardly fit at all, which told me how thin a model’s hands are. Here I am, ready for my modeling photo shoot! We had some fun and I posed a bit with Taylor. I was asked to look up and not to smile. Easier said than done! After modeling a little, I now have a tremendous respect for models. It’s about being able to convey emotion in your eyes and in your face while keeping your body in an awkward position. The way you stand and the way you bend your back can make all the difference in proportion to the camera. I had to bend back a little, since Taylor was much taller than me, but looking back on the photos, it might have been better to bend my knees, since I looked a bit like I was caught in a trap and trying to get away! It was also quite an experience to have a cover model staring at you with such intensity. After the mini-photoshoot with Taylor, I changed out of my costume and Marie-Eve used the same leather tunic on Taylor, but this time showing a little more of his chest and abs in the shoot. More of the shots were taken, some with him holding a sword and a helmet. The photo shoot lasted about three hours or so. 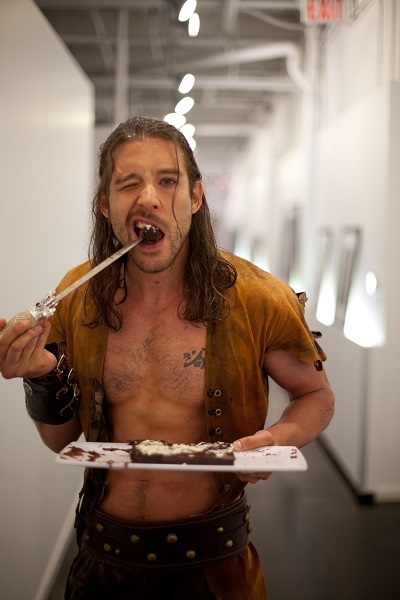 After an exhausting day of posing, here’s Taylor David kicking back with some brownies–Viking style! Next week, I’ll talk about how the cover is put together, after the final photograph is chosen. Then you’ll get to see my final book cover! Read part 5 of my Diary of a Photo shoot here. Enjoy book 1 in the Forbidden Viking series – To Sin with a Viking (Get it in e-book form on Kindle or Nook.) Want to ask questions or comment? Join me on Facebook or Twitter and ask whatever you’d like! Last, click on the link at the bottom of this post to enjoy a video of the photo shoot! When an author finishes a manuscript for Harlequin, we have to fill out an online questionnaire about the art that includes character information, a brief synopsis, and descriptive detail about the setting. The art director, Krista Oliver, then compiles a mock-up sheet to generate ideas of what the cover will look like. 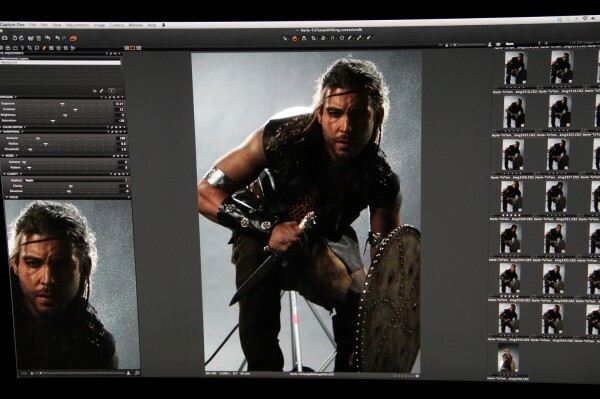 Here’s a sample mock-up of images and layouts she was considering for To Tempt a Viking. 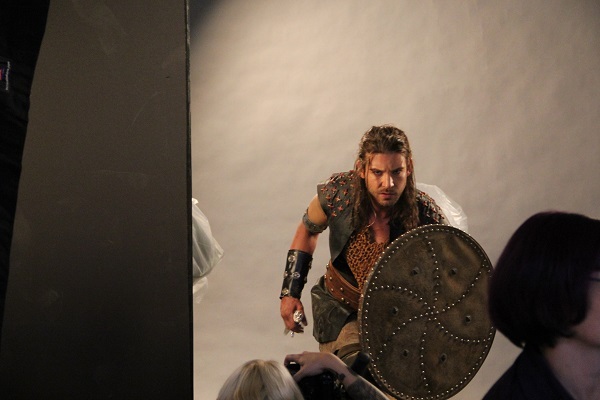 From there, a model is chosen for the cover, and in this instance, Taylor David became the Viking. Here’s a shot of the studio before the action takes place. Even when the photo shoot was about to start, the stylist, Marie-Eve, was adding last minute details like leather arm bracelets and lace-up leggings. 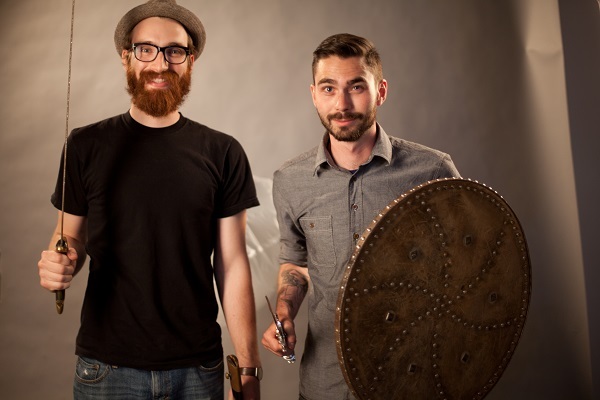 The make-up artist, Jukka, used a palette of different make-up colors to add details like battle wounds and scrapes to Taylor’s arm. Here’s a shot of the studio from above, where you can see the photographer Nikki Ormerod and the entire crew. 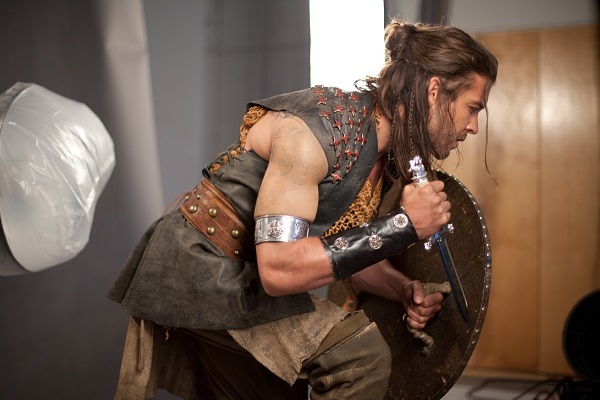 When the photo shoot began, Taylor did several poses where he was squatting down with the shield. The intensity on his face was striking. Many of the facial expressions went beyond the fierce warrior and then became more similar to a wounded hero or a tormented man. There was also a wind and water machine, to help create the illusion of a shipwreck. One of the assistants operated the wind machine and he periodically misted water in the air to drift down upon the model (the misting machine was like a handheld weed sprayer that you’d find at any hardware store). 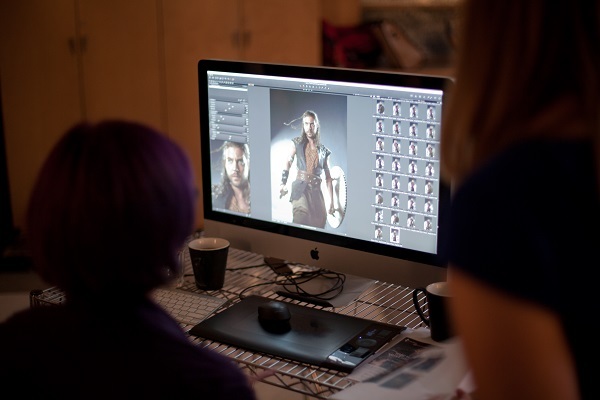 All of the images showed up on a high definition computer screen where the art director, Krista Oliver, looked at the various shots and determined when the poses needed to change. Throughout the shoot, the photographer, Nikki, was calling out how she wanted him to turn his face or his body. 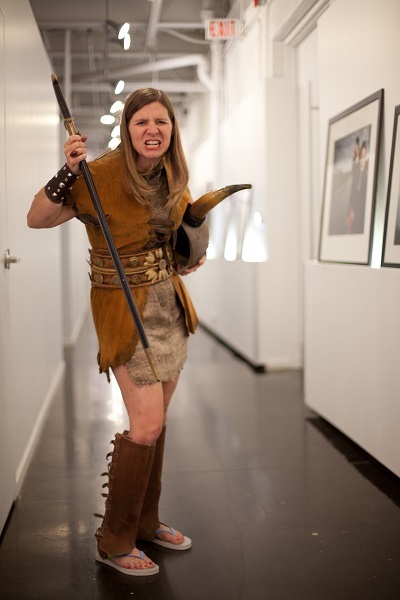 During the shoot, the art director, Krista, flagged several that she liked. 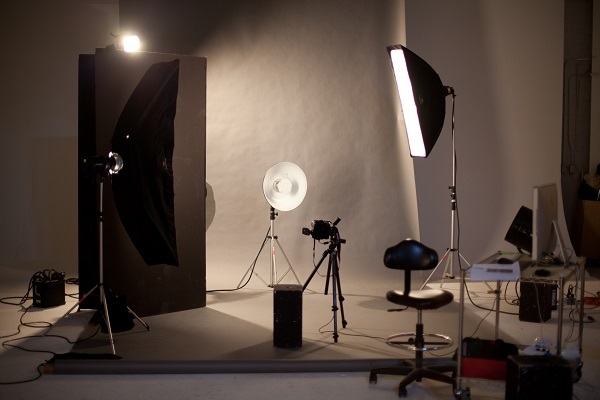 I learned that often over 600 photographs are taken during a single session. 95 might make it to the next round. From there, it’s a matter of determining which ones evoke the strongest visual reaction. Even the slightest change in angle or a costume detail can make the difference on whether a photograph makes the final cut. Next week, I’ll share the last few details about the photo shoot . 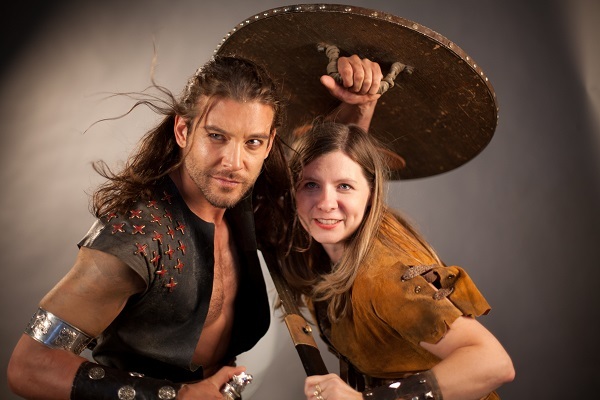 . . and how I got to become a Viking warrior woman and do a little bit of modeling myself! Read about part 4 of the photo shoot here. Enjoy book 1 in the Forbidden Viking series – To Sin with a Viking (Get it in e-book form) Want to ask questions or comment? Join me on Facebook or Twitter and ask whatever you’d like!